I know that very few people will have the need or the space to have a standalone device programmer always connected to a PC. In my case, I could not remember which PC had the software installed and how it was configured so it seemed like a good idea to create a bootable CD or USB disk. This would allow the programmer to be treated more like an appliance than a computer peripheral. When it came to choosing the operating system to use I did consider using ReactOS, which is compatible with WIN32 executables, but it did not support the serial communication API and would not allow parallel communication as Windows itself does not. Using Linux was possible for serial connections only but finding a distribution small enough was the problem. 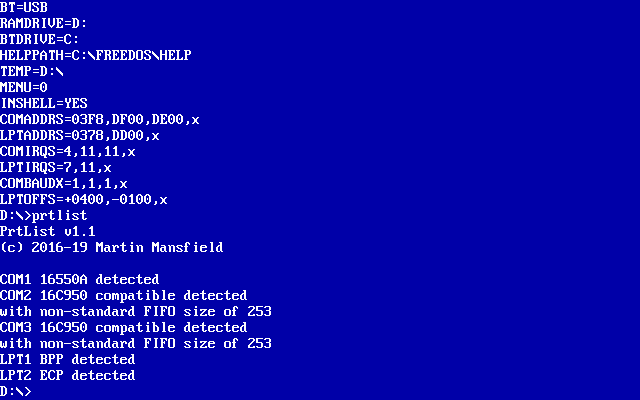 So I went with FreeDOS which does not have the licensing problems associated with MS-DOS. The initial bootable CD worked well with most older PCs but I discovered a problem when using the parallel version of the Stag protocol with some motherboards. The parallel ports on their Super I/O ICs did not seem compatible with the original IBM standard as many of these implemented a PS2 type port when SPP mode was selected. PS2 type ports are bi-directional instead of uni-directional and normally have outputs which are disabled for input and cannot be used with the Stag parallel protocol. When originally testing the parallel Stag protocol I could not get any ports fitted to a motherboard to work in PS2 mode if there was also a SPP mode available. StagView would detect the PS2 type port and report that the mode was incorrectly set in the BIOS. However, many Super I/O chips provide a PS2 mode with no separate SPP mode and change their output circuitry if set to uni-directional so Stagview now uses them but it performs a simple test to prevent hangs if the parallel port cannot be used. When I created StagView my intention was to allow the use of old Stag PP series device programmers with current PC hardware. Part of that work was the calibration of the delays required to work with old slow devices but, as the specification of a modern PC has changed greatly even from that of only 5 years ago, other problems have arisen when trying to run DOS communication programs on new hardware. The need for HDMI connectors and more USB ports on an ATX I/O plate has meant that serial and parallel port connectors have disappeared from the rear of PCs. The parallel port seems to have been removed from motherboards completely although serial port headers can sometimes still be found. The obvious answer is to use an expansion card to provide the serial and/or parallel interfaces. When the ISA bus was widely in use, adding a card involved finding a range of I/O addresses and IRQs that were unused and setting DIP switches on the card. As a result the address of a serial or parallel port would be fixed so that a DOS communications program would always be able to use it. Following the introduction of ISA plug-n-play and later the PCI and PCIe standards, the choice of addresses and IRQs was made either by the PC BIOS or a plug-n-play OS, which MS-DOS and FreeDOS are not. Since almost all DOS programs predate the PCI/PCIe bus standards they would be unaware of any serial or parallel ports on PCI/PCIe cards and unable to use them. Also, even if they could be configured to use them, as other cards are added or removed the addresses allocated by the PC BIOS for a specific card may change. So that serial and parallel ports on PCI/PCIe cards can be used by a DOS program the I/O address and IRQ must be known. Some manufacturers of interface ICs do provide DOS programs to configure them for use with DOS but none of them could be used in a bootdisk without a lot of work since the values needed are output to the screen and not easily available to other programs. Some store the I/O address for a port in the BIOS data area but some don't and the IRQ can not be stored as historically it was determined from the I/O address used for a port from the table below. Some allow the I/O address for a port to be remapped to one of the legacy I/O addresses in the table but because the IRQ cannot be changed to match the IRQ expected for that address it could only be accessed using the DOS device names COM1,LPT1 etc. which do not use interrupts. Also since every manufacturer supplied program only works with their own ICs this makes a universal solution very difficult. 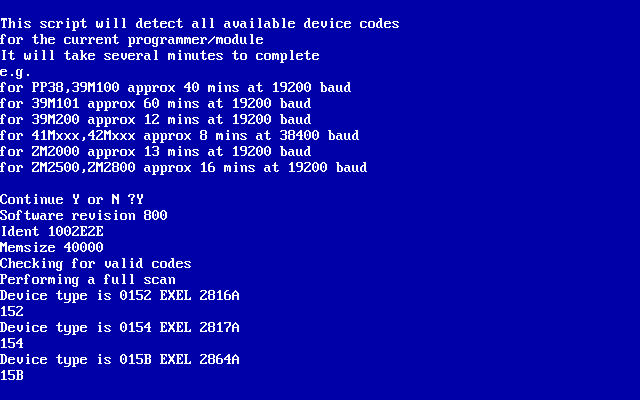 I created the PRTADD program to solve all these problems and allow the DOS version of StagView to use any serial or parallel PCI/PCIe card if it is in its card database. The database contains many of the latest PCI/PCIe cards and here is the latest card support list for PRTADD v1.1. 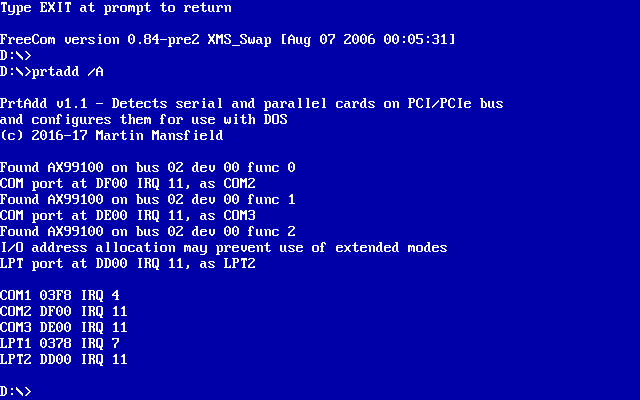 The program scans the PCI/PCIe buses for the cards in its database and allocates them to COM or LPT devices. It can also be configured to detect only legacy addresses for any ports on the motherboard if necessary. Finally, it sets DOS environment variables containing the I/O address and IRQ for each COM and LPT device. Also, for COM devices it sets a variable for the baud rate multiplier and for LPT devices it sets a variable for the offset of the extended registers from the base registers. StagView uses the values in these environment variables to allow it to access the ports of cards which are not even supported for DOS ! I could see how useful this program could be for other programs and so I also wrote a DOS batch file to extract the I/O address and IRQ for a port. The boot disk also uses it to configure the Kermit communications program to use non legacy addresses and IRQs as well. The SET command shows the environment variables and the last six variables here were added by PRTADD. They provide I/O addresses and IRQ no.s for COM and LPT ports, baud rate multipliers for COM ports and extended register offsets for LPT ports to DOS programs that need them, such as PRTLIST.EXE, STG.EXE and GP.EXE. I wrote this utility to identify the device type for each serial or parallel port which is known to the PC BIOS. If this is run after PRTADD it will identify any non-legacy ports on PCI/PCIe cards in addition to the legacy ports which may be on the motherboard. A few DOS communication programs can utilise serial ports at non-legacy addresses and interrupts but the vast majority can only use serial ports at the legacy addresses and interrupts. For those programs that only support legacy addresses EXEPATCH can be used to change the locations in the executable containing the legacy addresses and interrupts that it supports and replace them with the values for the serial ports that are discovered by PRTADD. The latest version of BBBD patches the Stag programs "stagcom1" & "stagcomdos" and Elan programs "exfile" & "lgprog" in this way to work with almost any serial port at runtime. 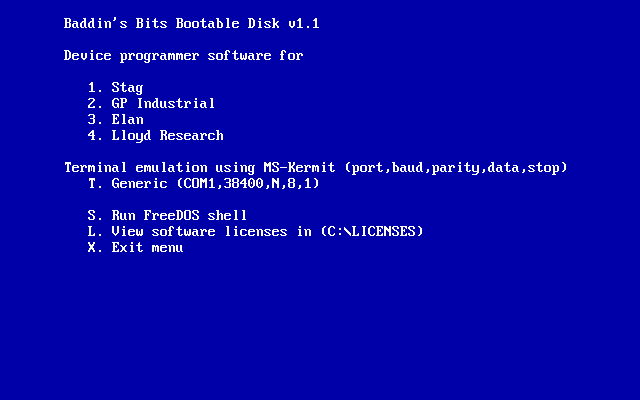 The CD boot disk uses the isolinux and memdisk programs to boot a FreeDOS floppy image. 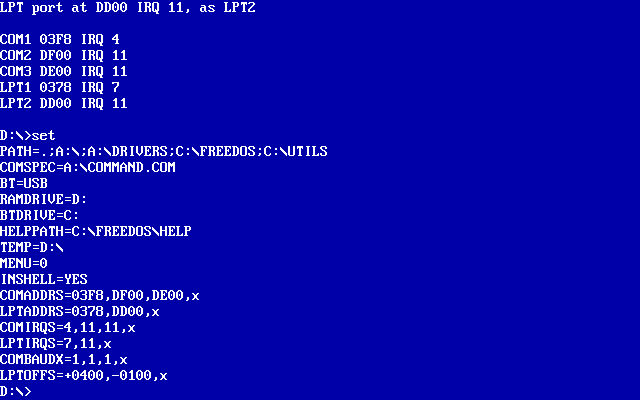 This FreeDOS image loads drivers for the CDROM drive and runs the BBBD.BAT file in the root of the CDROM filesystem. For a CD boot the CDROM drive letter will be allocated after any local hard drives that FreeDOS has detected. The bootdisk does not itself modify any files on any local hard drives but instead creates a ramdisk which it uses to read from and write to. It will be necessary to copy files between the ramdisk and a removable drive before powering down or rebooting the PC as the ramdisk contents would otherwise be lost. If a USB boot drive is used then the files can be copied to and from that and I plan to do this save and restore automatically. Alternatively, you can copy files to and from a local hard drive which is in FAT12, FAT16 or FAT32 format. I use the Rufus program to create a USB boot drive from the CD boot disk ISO. For a USB boot the USB drive letter will be C and any local hard drives will be allocated letters from D onwards, as you can see the drive letter allocations are different to those for a CD boot. Initially the boot disk always loaded the CD-ROM driver but while testing the USB boot disk I found a PC with a BIOS which generated an error when the driver for a CDROM drive was loaded if the drive was empty. I needed to know which type of boot it was before loading the driver for the CDROM. I thought that it would be easy to detect the boot type and set the return value of the program accordingly. There are many different PC BIOSs using different APIs or having their own way of showing this information. 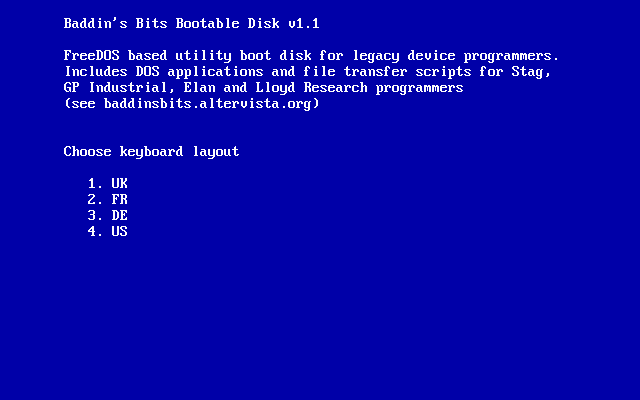 There is the BIOS Enhanced Disk Drive Specification from Phoenix versions 1.1 to 3.2 and the El-Torito Bootable CD-ROM Specification from Phoenix & IBM but some BIOSs just map the USB drive or CD drive to an invalid drive number. BOOTFIND took much longer to write than expected and involved testing on 13 different PCs before I could be reasonably confident that it was ready to use. Although by this time I thought that I had tested all the cards supported by PRTADD, by chance I decided to try sending data to a Stag PP41 using a PCI card with a NetMos 9845 supporting six serial ports (although BIOS can handle only four). This particular card was interesting because I had picked it up on eBay as untested and as six port cards are uncommon I took a chance. The card had worked correctly with Windows 98 running the WIN32 version of StagView so no problem I thought. When using it from the boot disk the data sent to the programmer was corrupted but when sending commands all was well. I thought that the delays added by StagView for sending data were now not large enough but increasing them did not help. I decided to add some code which tested the FIFOs of the chip before connecting but the test failed when the same test passed on several other cards. After debugging the FIFO test I discovered something very interesting and worrying about the NM9845 (and also the NM9835), it is not completely compatible with the 16550 UART. Since the Windows drivers have been written by the manufacturer they must handle the issue but DOS programs which expect a working 16550 UART may not work correctly with the NM9835 and NM9845. see this page Serial/Parallel port compatibility. The serial port code in StagView that calculates the size of the transmit and receive FIFOs polls bit 6 of the Line Status Register to determine when both the transmitter and FIFO are empty, bit 5 of the same register indicates when only the FIFO is empty. The 16550 UART specification says that bit 6 is set when both the transmitter and the FIFO are empty but the NM9845 sets bit 6 if the transmitter only is empty. After storing a character in the FIFO bit 5 is cleared but there is a slight delay before it is moved to the transmitter and then bit 6 is cleared. I modified my code to check that both bits 5 & 6 are set to allow for this design flaw in the device. Pressing the '3' key will run the device scan script which is used to discover all devices supported by the Stag firmware. Download the zip file containing an ISO file. This version provides applications to control the programmer using remote mode for Stag PPZ,PP3X,PP4X series, ZL30A/B, System 3000, Solar, Eclipse, Orbit 32, Orbit 48, P301, P800, P801, P803, GP Industrial XP640 and Elan 5000 and scripts to provide basic file transfer for Lloyd Research L9000, GP Industrial XP640, EP4000, EP8000, P8000 and Elan 5000 and diagnostic tests for Stag PPZ,PP3X,PP4X series and GP Industrial XP640. Use a CD burning program such as Nero to write the contents of the BBBD ISO file to a CD-R or CD-RW. Use the program Rufus to create a USB drive from the BBBD ISO file. You should disconnect any other USB drives being used in case they are overwritten by mistake and connect the USB drive which is to be made bootable, start Rufus and it will automatically select it. For the "Partition scheme" option select "MBR partition scheme for BIOS or UEFI" and for the "File system" option select "FAT32". For the option "Create a bootable disk using" click on the dropdown box and select "ISO Image" then click the icon next to it and select the bbbd.iso file. Now click on the icon next to "Format Options" to display the advanced options. I normally deselect the "Create extended label and icon files" and select the "Add fixes for old BIOSes". At this point, check that the correct USB drive is selected and if it is then click the "Start" button. When finished click on "Close" and ensure that the USB drive is unmounted (e.g. Use "Safely Remove Hardware" icon for Windows) before disconnecting it. For an older PC which does not have USB ports you will need to boot from the CDROM but you will need to enter BIOS setup first, usually by pressing the DEL key or a function key. Check the configuration for boot order and change if necessary so that CD-ROM is before Harddisk in the list. Save your changes and restart the PC. For an older PC which has USB ports and a 1.44MB floppy drive but does not allow booting from USB drive you can boot from a floppy disk containing the Plop boot manager which will then boot from the USB drive. You may need to change the boot order configuration so that Floppy Drive is before Harddisk in the list. Please note that it is not guaranteed to work with all computers and if it does work the USB drive will be read-only and the floppy drive should be used to transfer any data files. The floppy image and instructions to create the bootable floppy can be found within the CD or USB drive created from the ISO file. For newer PCs either using legacy BIOS or UEFI with emulated BIOS you should check in the BIOS setup that Legacy USB support is enabled. 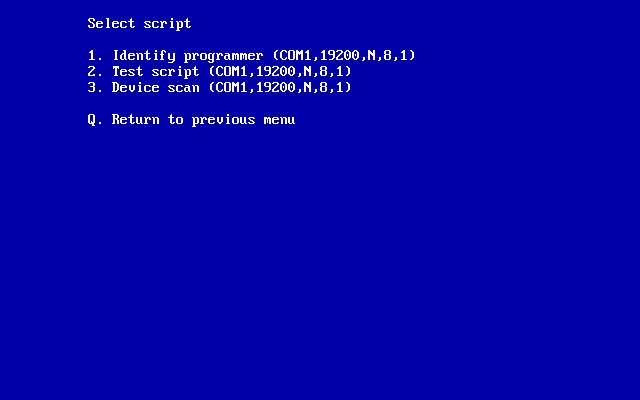 When the PC next displays the BIOS screen there will be an option to select the boot device by pressing a key. The key to press will normally be one of the following, starting with the most common. For newer PCs with UEFI and secure boot enabled they will not boot the BBBD and you must disable secure boot if possible in the UEFI setup. UEFI PCs that emulate BIOS will run FreeDOS much faster than the PCs available when a DOS application was originally written. Some parts of the application may not work correctly because timing loops were used for delays so that with a faster PC the delay will be much shorter. 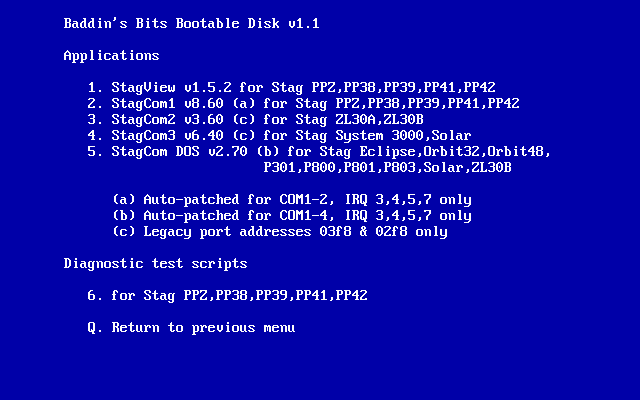 An example of this is File Transfer with StagCom1, which is one reason why I wrote StagView, but the alternatives for other applications are to use BBBD on a slower, older PC or, for applications using the serial port with no hardware handshaking, run them within DOSBox installed on a modern Windows or Linux OS.